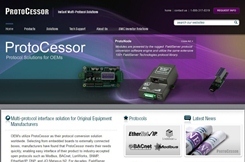 FieldServer Technologies announces the new ProtoCessor website featuring the ProtoCessor OEM Gateway, used by OEMs worldwide as an effective fast way to enable easy interface of their product to industry-standard open protocols such as Modbus, BACnet, LonWorks, SNMP, EtherNet/IP DNP and more. The new website is designed to make it easy for users to determine which protocols and which ProtoCessor hardware are necessary to meet their interoperability requirements. The “Products” section covers the four primary types of ProtoCessor solutions available. Visit the ProtoCessor website at www.ProtoCessor.com for more information. SelectPro™ has been through many changes and enhancements this past year but with constant focus on flexibility and ease of use. Everyone's work habits and requirements are different, that is why you need a tool that will be available to you whether you are in the office or on the run. SelectPro™ online gives you the flexibility to access all your projects from any computer at any time. The only thing you need is internet access. SelectPro™ online version now offers the complete Belimo product line: Valves, Damper Actuators, Fire and Smoke Actuators, Pipe Packages, Retrofit Solutions for Damper Actuators and Control Valves. Users are now able to replace existing competitive damper actuators and retrofit competitive control valves. The Nest Learning Thermostat is available for preorder at Best Buy and Nest.com, and will ship in November. The Nest is the iPod of thermostats. A simple loop of brushed stainless steel encases a chassis of reflective polymer, which encircles a crisp color digital display. Artificial intelligence figures out when to turn down the heat and when to jack up the air conditioning, so that you don’t waste money and perturb the ozone when no one is home, or when you’re asleep upstairs. You can communicate with the Nest from your smartphone, tablet or web browser. Fadell promises the Nest will pay for itself within a year or two of use, and ultimately save you up to 30 percent of your utility bill. And its presence on your wall will be less an artifact of the industrial age than a piece of high-tech art. L-IOB I/O Modules: LonMark® certified now! 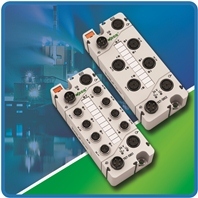 The LOYTEC I/O modules LIOB-150 now are LonMark® certified and available for shipping. The universal L-IOB I/O Modules offer local operation through a jog dial and have a built-in LCD display with backlight. From the display device and data point information is shown. The jog dial is used to view detailed data point information and to permit manual override locally on individual inputs and outputs. Based on LOYTEC 32-bit L-CORE Technology, the L-IOB I/O Modules offer outstanding performance in a LonMark system via TP/FT-10. With capability for 512 address table entries and an Enhanced Command Set (ECS), LOYTEC guarantees the highest flexibility in operation and eliminates binding limitations. Lascar Electronics has extended the functionality of its existing temperature data logger with the addition of a 2 1/2" digit LCD display. The EL-USB-1-LCD will now allow users to toggle between the current, maximum and minimum stored temperatures taken during the current logging session without interrupting the session or removing the data logger from the field. Previously, data could only be viewed by taking the logger back to the computer, stopping the current logging session and downloading all results. The EL-USB-1-LCD measures and stores up to 16,378 temperature readings over a -35 to +80°C (-31 to +176°F) range. The user can easily name the logger, set up the logging rate and start-time, set high and low alarms and download the stored data by plugging the data logger into a PC’s USB port and running the purpose designed software under Windows 2000, XP, Vista, and 7. Data can then be graphed, printed and exported to other applications. The new Cooper Power Systems CCU-721 Gateway offers utilities the industry’s fastest, most cost-effective, two-way power line carrier (PLC) communications to Advanced Metering Infrastructure (AMI), Demand Response (DR), and Grid Automation endpoints. The CCU-721 provides utilities ease of installation and integration, as well as a user-friendly front panel interface for field personnel. The CCU-721 is an IP-based gateway that also supports a myriad of wide area network (WAN) options for utilities via Cooper Power Systems SelectComm™ technology. The CCU-721 PLC gateway joins the family of next generation PLC solutions offered within the Cooper Power Systems Advanced Metering Infrastructure, Demand Response and Grid Automation solutions portfolios. Venstar®, a leading thermostat and energy management systems supplier, today announced the availability of its new Slimline Platinum residential thermostat (Model T1900) with a convenient built-in humidity module which allows the thermostat to not only automatically control temperature but humidity as well. Venstar’s Slimline Platinum residential thermostat Model T1900 includes many energy-efficient features, including Energy Watch, which tracks heating and cooling runtime hours, and Energy Save, which intelligently recalculates the start time of the morning period, depending on environmental factors, to reach the programmed setpoint quickly and efficiently. In addition, it is equipped with a drain pan alert, enabling the thermostat to shut down the cooling system in the event of a leak. It is programmable for seven days per week, with up to four time periods per day, and has an auto changeover three-stage heat/two-stage cool for use with gas/electric, heat pump, electric and hydronic heat systems. It is compatible with Venstar’s line of wired and wireless remote temperature sensors. CAS DataLoggers recently provided a major automobile manufacturer with the data logging solution for its rigorous performance validation testing. As part of the testing of any new vehicle, sample units were typically subject to a variety of endurance and durability tests to identify any potential weak points or failure modes and chart their performance. To gather the most detailed record of a car’s data throughout these speed validation tests and ensure the safety and robustness of the entire product line, engineers needed highly accurate, reliable data logging equipment. These devices would have to be capable of measuring the many parameters used to gauge the cars' performance as well as be portable and compact for quick placement and retrieval from hundreds of test cars. 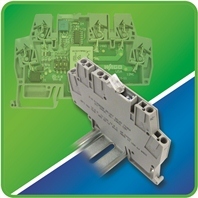 DimOnOff introduces a unique inline dimmer capable of controlling up to 15amps of incandescent and Halogen (MR16 type) lamps, phase angle dimmable ballasts (such as Mark X from Philips) or LED lamps on voltage ranging from 120 to 347V (Note: a 20 amps model is also available on special order). This is the first of its kind in the EnOcean products portfolio. A second innovation brings a newly added feature to an already very powerful product of the DimOnOff family called INT-ADR-XB. Released earlier this year, the INT-ADR-XB is a compact interface to add addressability, digital and analog inputs, long range wireless networkability and intelligence to leading market-standard power pack / relays modules (such as Hubbell Leviton Wattstopper). Two new eight-channel, configurable Digital Input/Output (DIO) Modules have joined WAGO Corporation's IP67 SPEEDWAY 767 I/O-SYSTEM. Configurable channel-by-channel, the 767-5801 & 767-5802 modules (24V DC, 0.5A) run in direct input (DI), direct output (DO) or mixed DIO modes. This versatility, and a segment-leading -25°C to +60°C operating temperature range, enables users to methodically tailor SPEEDWAY to meet application requirements. 767-5801 (8xM8 connectors) and 767-5802 (4xM12 connectors) record binary signals from sensors, proximity switches and controls actuators, e.g., DC contactors or indicators. Capable of channel and module diagnostics, the 8DIO Modules provide parameterization of filter, inversion, substitute value strategy, manual mode and online simulation. Additionally, the modules can be configured with two 1kHz counters with event, gateway time or pulse duration modes. They can also directly switch module outputs based on counter status. The new Telaire T8700 wall mount humidity and temperature transmitter from the Advanced Sensors business of GE Measurement & Control Solutions can help to control building energy efficiency, maintain a comfortable environment and minimize condensation problems. It offers accurate and repeatable measurement and transmission, and its easy installation fits it for application in a wide range of commercial buildings. The new transmitter uses GE’s own ChipCap sensor that has very fast response times and long-term stability. The plug-in ChipCap sensor module also allows quick and simple field replacement eliminating the need to replace or return the complete transmitter for recalibration. The transmitter has an accuracy of +/- 2.5 percent and has standard analog outputs, including 0-5V and 4-20mA, which are all user selectable. Temperature measurements can be made by the active signal conditioned output as well as the standard passive 10K Type II thermistor. For more information, visit http://www.ge.com. This is the smallest and most cost efficient hardware module in Imsys’ SNAP family (Simple Network Application Platform). It builds on previous generations of the SNAP FX (small mezzanine) and SNAP Classic (SIMM72) modules. Featuring the newest Imsys processor generation and providing full access to the processor’s features, it’s ideal for OEMs needing a powerful computer on module for minimizing time-to-revenue. 1. Real‐time updates of the stock in the machine. This can help operators identify which products sell best, and also allows the machines to be quickly restocked when supplies are low. 2. Sales transactions, vending temperature, malfunctions and send alarms on events of crime. Lighting control systems are making their way into today’s classrooms as energy codes, tight budgets, and proven effects on student performance are making them a necessity in new and existing schools. To meet these new challenges, Lighting Control and Design (LC&D) has created Academy Pack, a complete lighting control solution designed specifically for the classroom or campus. With the academy pack solution, schools can enhance the learning environment, reduce energy consumption and provide a more secure learning environment. The system is both easy to install and operate, and can be customized to meet specific needs. Choices allow for simple operation or more robust control. The teacher can select different lighting scenes with an intuitive Teacher Control Station, pre-program lighting levels, or override the system as needed. This book promotes the benefits of the development and application of energy information and control systems. This wave of information technology (IT) and web-based energy information and control systems (web based EIS/ECS) continues to roll on with increasing speed and intensity. This handbook presents recent technological advancements in the field, as well as a compilation of the best information from three previous books in this area. The combined thrust of this information is that the highest level functions of the building and facility automation system are delivered by a web based EIS/ECS system that provides energy management, facility management, overall facility operational management and ties in with the enterprise resource management system for the entire facility or the group of facilities being managed. We understand that the proper management of energy, water and other resource usage is vital for everyone in today's economic climate, however, without timely and accurate information, it is difficult to achieve. 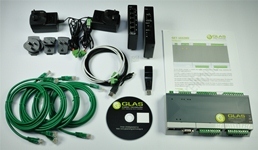 We at GLAS Energy Technology can provide the tools you need to record and monitor your usage in precise detail, using our smart technology. Our products allow you to see what is happening in real time. This means that the effects of any adjustments you make to your system to reduce your usage can be seen quickly thus allowing you to make decisive action plans. Using real time metering data also allows you to see issues before they become expensive problems, saving you money and effort. Energy measuring will be at your fingertips so you have the power to control how best to use it. • Biogate – server mode over TCP/IP or Weigand interface. WAGO Corporation's 859 Series DIN-rail Timer Relay Module offers On-/Off-Delay timer modes and multiple time ranges for diverse applications such as switch and package "de-bounce" sensors. Unlike traditional designs, the 6mm 859 Seriescarries a top-mounted potentiometer for fine-tuning delay time without removing unit from DIN-rail. On-Delay mode can prevent simultaneous excess inrush currents by delaying machine startup. Off-Delay mode can enable auxiliary components, e.g., fans, to continue operation after machine shutdown.